Here is a look at the 454 Jung Jing Rd. Los Angeles, CA before Vivache Designs transformed it. WOOW! With urban and street art’s popularity ever on the rise, many businesses and organizations wonder where they can get custom wall mural work painted. In California’s Greater Los Angeles Area, Vivache Designs has answered the call and are creating one of a kind wall murals that are turning heads, disrupting the mural painting world, and winning rave reviews. The most recent mural painting from Vivache Designs was done by mural artist Michael Che Romero at the Mei Mei Lou Chinatown Building, 454 Jung Jing Rd., just behind the area’s famed Bruce Lee statue in Downtown Los Angeles. Romero calls it the “Chinese Liberace” building because of its eccentric motif & op-art design and vibrant color schematic. Vivache Designs was hired by Gilmore & Associates, a premium Los Angeles real estate developer. They hired Vivache Designs to handle the mural rendering of architect firm, Atelier Manferdini with 100% precision and accuracy – a challenging mission Vivache Designs accomplished with flying colors. The all-around enthusiasm surrounding the project before, during, and especially after has been off the charts. We ran into some issues with the building not being level, so we had to real-time problem solve and came up with something spectacular. It looks like the vistiors and the people of Los Angeles’ Chinatown are liking the new Mei Mei Lou building. Murals of all sizes, complexities, places and colors can be accomplished by the team at Vivache Designs. The company are professionals and are more than happy to discuss any potential projects, give suggestions, and deliver a free estimate. Examples of their work can be seen on the company’s website. 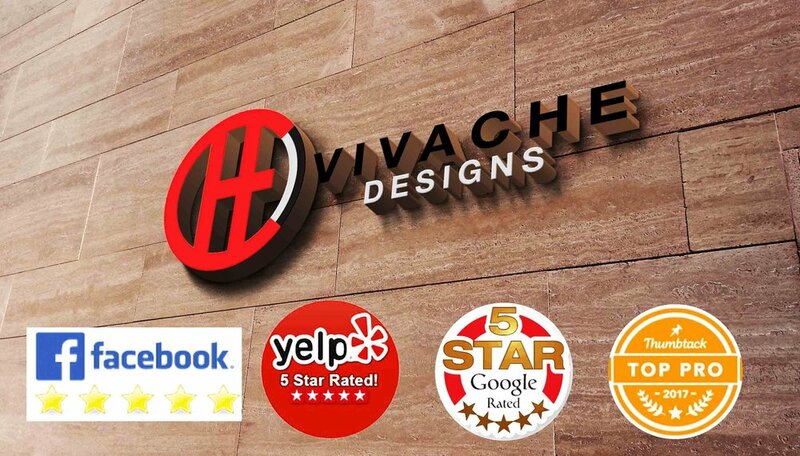 Vivache Designs has nothing but five-star reviews across Yelp, Google, and Facebook, with the team never satisfied until their clients are completely happy. To learn more be sure to visit http://vivachedesigns.com. With our 5-Star proven reputation, Vivache Designs continues its success as a trusted art and design firm. We have gained notoriety in elevating brands and spaces through creative mural designs and mural paintings. The artists at Vivache Designs can paint any mural of your imagination, just look at our gallery and see our amazing mural paintings. The power of mural paintings and creative collaboration within our local community can be super powerful. Can art, music and culture influence and spark amazing bands like Black Flag, Pennywise and The Circle Jerks? Absolutely! And now it can bring a once loud anti-establishment counter-culture rebel musical movement into the heart of Downtown Hermosa Beach, now honored & immortalized through this massive historical punk rock skate street art mural. This mural is epic and will become a historic mural!!! This mural was painted by mural painters Vivache Designs' Creative Director & Artist Michael Che Romero. Special thanks to the Daniel Inez & Josh Kimbrell, the city of Hermosa Beach, Hermosa Beach Murals Project, Fletcher & Justin of the Pennywise Familia. Punk Rock is immortalized forever in Downtown Hermosa Beach. This mural will create a stronger sense of community, creating awareness and tell the story about Los Angeles' West Coast Punk Rock Heritage. This was a massive collaboration mural painting project between the city of Hermosa Beach, Hermosa Beach Murals Project, Daniel Inez from M1SK (hired mural painters Vivache Designs), and Local Tattoo Artist Josh Kimbrell. Go Check out our massive 3 story street art punk rock skate mural located at 1301 Hermosa Ave, Hermosa Beach, CA 90254. This short video clip shows the mural getting unveiled by Vivache Designs' Creative Director and Artist Michael Che Romero our Mural Artist / Mural Painter / Muralist. Follow us on Twitter, YouTube, Instagram, Snapchat and Facebook @VivacheDesigns. Go to www.VivacheDesigns.com for your free quote / call 1-866-VIVACHE / 1-424-248-9243 for more information. We are Local Mural Painters, Mural Artists and Muralists that are passionate about creating mural art that sparks curiosity, intrigues and engages the mind, and tell a story of the creative visual narrative. Captivating a audience through murals by showcasing the cultural nuances of the local landscape and local communities is our forte. Flying Mural Painters Invade The LA Sky!? Mural Painting Drone Coming in 2022? In less than 15 seconds you will see this mural painting unfold, but if you blink you will miss it all, so pay attention, hang on to your hats and enjoy the ride. Vivache Designs is your #1 rated, trusted and proven mural painters in Los Angeles the United Sates & Worldwide. The Hermosa Beach Mural Project is celebrating the unveiling of Mural #8 Punk Rock/Skateboard era of the 1970’s and 1980’s on Tuesday, October 2 @ 5:30 pm. 13th and Hermosa Avenue. Local punk legends will be on hand as Dan Inez’s mural is dedicated to the city of Hermosa Beach. Limited Edition Posters and tees will be able for purchase. Families & kids of all ages are encouraged to join us at the unveiling. Fundraiser immediately after at The Standing Room. Tickets for fundraiser reception are required and can be purchased HERE CLICK NOW. From a small mural painting to large scale mural paintings i.e. buildings, lofts, restaurants, you name it we have done it all. We are your proven mural painter and art design experts. Just take a look at our 5-Star ratings and what our customers are saying about us on GOOGLE, YELP, FACEBOOK, and HOUZZ. With our exceptional personable customer service, vast depth of art knowledge & mural painting technical skill-sets combined with our 100% Satisfaction Guarantee; Vivache Designs' process makes it easier then a Sunday afternoon at the beach. We are a breeze to work with. 5 Mistakes to Avoid When Hiring a Mural Painter. I will teach you how to find the BEST 100% trusted, PROVEN most reputable mural painter or mural painters in your local area. We want you to have the GREATEST experience possible finding the most AMAZING local mural painting company or a commercial mural painter in your city, local area / community. Do they have a mural painting website, a mural painter portfolio, a mural client testimonials, and mural painter submission forms, mural painting name/brand/client list? (do your research). Let our 5-STAR review give you the confidence in our mural painting abilities. Mural Painter Vivache Designs is your mural painting expert. Google search for the keywords like mural painter, mural painters or mural paintings name on Web Sites like Yelp, Houzz, Angie's List and Facebook and read reviews. (Would you go to a restaurant or hire a plumber that has less than a 4-Stars? Mural Painter Vivache Designs is accredited, insured, and has a 5-STAR reputation. Ask them about their mural painting process, who are the mural painter or mural painters and muralists they have on their mural painting team, and any other mural painting questions you might have. *All professional mural painting companies do not do FREE WORK. A design fee for your project it could range from $200-$3000 depending on the scope and range of work. Mural painter cost might slightly vary depending on the scope of the mural painter work. Do they offer a mural painting site survey or a free mural painter quote? Does the mural painter come to see the potential mural paintings location's space? Do they have a Mural Painter or Mural Painting Contract? Do they take pictures? Take measurements? Ask questions? And then after they put all the numbers together they will give you a mural painting quote? And in how many days / when will you get the mural painting estimate? This will give you the opportunity to meet the Mural Painter / Mural Painting Company to see how professional the local mural painter or local mural painters are in person. The last thing you should ask for before moving forward or signing a contract is to ask a mural painting company like Vivache Designs for at least 3 mural painting references. The client who received the mural painting and spoke with the mural painter will share their insights with you about the mural painters and mural painting company. And if they do not give you and references do not move forward with that particular mural painter or mural painting company. Here are a few questions to ask the mural painters reference. Overall how was the mural painting company to work with? On a 1 to 5 scale, how would you rate the mural painter? Would you hire the mural painters again for future mural paintings? Follow all of these 5 steps and your mural painting experience should be an easy one. And finding a great mural painter should take you no time at all. If you have any mural painting or mural painter questions please feel free to give us a call at 866-VIVACHE / 866-568-7257 / Click Here For Your FREE QUOTE NOW! Learn The Truth About Mural Painting In The Next 60 Seconds. Watch This Video To Find Out The Truth? Vivache Designs is your proven trusted mural painter. With our 5-STAR reviews on YELP and Google our work speaks volumes. Whether you are interested in specialty hand-painted art or murals for your home, business, restaurant or building - we are your one-stop resource for creative high-quality Mural Designs and Art. We know how to paint art on EVERY surface imaginable including brick, concrete, wood, metal, plastic, glass and fabric on both interior and exterior spaces. DONE FAST - CLEAN - AFFORDABLE & SAFELY. From a living room wall - to a 50 foot outdoor promotion or advertisement on the side of a building we can paint it right. Looking to get your company logo to stand out on walls, buildings your restaurant or signs?. We do stencils, reproduction logos and graphics for business and offices. We can create a design for you or work off your plans, sketch or ideas. Our wall art muralists are the best in the business - and have completed hundreds of projects throughout Los Angels and the United States. Our work is all done using the highest quality prep work and materials - one brush stroke at a time and designed with you in mind. And we are licensed, insured and operate safe and clean workspaces. Located in the heart of Los Angeles; we service residential and commercial clients in Los Angeles, Santa Monica, San Fernando Valley, the South Bay, Orange County and the surrounding areas. Let us know about your mural painting project, just fill out the form below and you will be on your way to having an amazing mural in no time at all. It is as Easy as 1,2,3! Mural Complexity * Landscape Custom Design Logo Graphic Simple Signage Portrait Other I don't know? 3 Brilliant Ways To Advertise With Wall Mural Paintings. We CREATE murals, CURATE & MANAGE large-scale mural installations and ACTIVATE spaces. Vivache Designs is an award-winning creative mural agency specializing in commissioned large-scale interior/exterior murals, contemporary art, street art & urban art installations for malls, empty spaces, government buildings, offices, music venues, sports arenas, businesses, centers, buildings, shops, cafes & restaurants, homes, mural galleries, events, live painting and more. Vivache Designs' passion is to create captivating, culturally relevant murals that enhance urban landscapes, transform spaces, engage audiences, and activate brands for big to small. Each and every piece of artwork we create is original, one-of-a-kind, hand-painted and custom designed from your vision – the possibilities are endless as the creative mind. Based out of Los Angeles, our professional team of muralists and urban street artists are available for hire throughout the world. Our model is simple we partner with the best mural artists in the world and empower them to create change and innovate how people, art murals, and spaces can positively impact the environment in which they exist. We are the go to mural co.
#2 Photo & Video Shoots. #3 Create an interactive engaging mural. Every year all of us at Vivache Designs work together with our local communities giving back in any way possible. This year we worked with the Los Angeles Fire Department and the LAFD Fire Station #34 located at 3661 7th Ave, Los Angeles, CA 90018 on a community service project creating and painting a custom designed wall mural that exemplifies and represents the Jefferson Park neighborhood in Los Angeles. Our team had a great time painting this custom wall mural and watching the constant in and out of the firefighters, fire engines and fire rescue vehicles at Fire Station #34. We heard some unbelievable stories while painting the mural. Special thanks to all of the firefighters for all of the meals and cold brew coffee. Hope you all at Fire Station #34 enjoy your custom Vivache Designs painted mural. We were able to unveil this original Vivache Designs LAFD Fire Station #34 custom wall mural on Fire Service Day with Chief Terrazas at Fire Station 34 in Jefferson Park on Facebook Live. From giant painted murals to small scale murals on buildings, lofts, restaurants, you name it we have done it all. We are the mural and design experts that have been transforming local community cityscapes, by beatifying all that we touch with our custom painted wall murals, designs and art work. Call Vivache Designs at 866-568-7257 to schedule your free consultation or email us at info@vivachedesigns.com and send us the scope of your project. Let our 5-STAR reviews on YELP and Google give you the confidence in our art design and mural painting abilities. Mural Paintings? The Truth Is About To Be Revealed! A Mural Painting Can Do..? Wall murals are transformative, taking a stale, oppressive white wall and making it a beacon of beauty, expansiveness, and captivating. A wall with a mural transforms a dead space, a "don't look at me, it's not my fault I'm here" wall into a platform that celebrates humanities most creativity minds. It changes mundane to full of life, and the everyday into an extraordinary moment of inspiration in real time. Energizing and revitalizing the space, which it exists. Vivache Designs passion is to design, create and paint artwork that is magnificent enough to stop viewers in their tracks with an “ooh” , “ah” and “wow”. Our clients vary from professional creatives including architects and designers to building owners, school administrators, and community advocates. Many of my clients would not consider themselves artists, yet they carry a vision of what is possible for a space they care about. We help our clients develop their idea into an uplifting and powerful narrative that becomes an engaging visual gift to their communities. Each piece we create is custom and site-specific. We consider the perspective from which the artwork will be viewed, the lighting, the scale of the space, the colors, mood, and the story we want to tell with the piece. The whole process of brainstorming, creating, and fine-tuning the finished piece is an adventure. And it's a ton of fun. We invite you to spend some time on our website, reading about the experiences of past clients, getting to know us through our videos and blog. If you think Vivache Designs might be the right fit for your project, we would love to hear from you. Quiz: How Much Do You Know About Wall Murals? I want a mural, but how do I get started? We will teach you 3 simple steps on how to get started on the mural process. #1. Where Do I Begin? By reading this you are taking the first step to gaining the secret knowledge of the mural process. Most of us have no idea about the process and cost of a wall mural. Don't worry this is normal and the majority of our clients have yet to gain the knowledge and understanding the mural design process. So let's get started on this educational journey together and begin the custom wall mural process from start to finish. Do you have a vision or idea of the mural in your mind, but have nothing on paper? Not a problem, we can help you create a custom one of a kind mural design. Our team at Vivache Designs are comprised of true artists, graphic designers, muralists, painters, and creatives. We can take the vision and idea that is floating your mind, transport it, and make it become a physical reality; A Visual Mural Masterpiece. Or do you already have a mural design ready? And need a muralist to execute your custom mural with precision, exact specs, scale, detail, and color. We have a portfolio and 5-star customer reviews that proves our expertise, professionalism and precise execution on all of our wall mural projects. Need us to sign a Non Disclosure Agreement (NDA) before we get started? Just send it to info@vivachedesigns.com. From custom wall murals, branded murals to one of a kind art murals, Vivache Designs has you covered. Don't wait until the last minute to start your project. Give yourself plenty of time to schedule your project. It will save you time, money and stress. Once you contact us via 1-866-568-7257 / Info@vivachedesigns.com / submit an inquiry via our Free Quote Page. You can then send us all of your project assets, which include Mock-ups, Logos, Pictures, Images, Paint Specs, Measurements and Architectural Renderings that have to do with your mural project. By sending us all of your project assets we can quickly and efficiently expedite your estimate on your wall mural project. You are almost at the finish line at becoming an expert in the world of the custom wall mural design process! We are professionals and a contractual agreement lets you know we are ready to move forward. Once the mural pricing is agreed upon we will send you an official Vivache Designs contract via email and your wall mural will be scheduled, so it can be painted at a future date. At this point, you can relax and kick your feet up. All of your research and effort finding the best mural company is done. Your job in finding the most reputable wall mural and custom art design company is completed. Now just sit back and watch your mural come to life! And after it is completed you will see just how much you and all that see it will be in excited and admiring the work of art. Let us design and create a mural that will make your business come to life. We create visually appealing designs & branding that will be ingrained in onlookers minds. We are the #1 provider of design and wall murals in the greater Los Angeles area. Call us at 1-424-248-9243 to schedule your free consultation. We are Master's of design and wall murals. Let our work and reviews (YELP, Thumbtack and Google+) give you the confidence in our abilities. We are the mural painting experts in all of Los Angeles. When painting a mural on an old brick wall, it is necessary to apply spray-paint and that is why we use ultra premium Montana spray paint https://www.montana-cans.com/. At Vivache Designs we buy all of our spray paint exclusively from RD Artist Supply in La Habra, CA http://www.rdartistsupplies.com/ because they have the best prices & customer service in all of the greater Los Angeles area. 3 Reasons To Paint A Mural In Your Restaurant! Vivache Designs launches into the restaurant industry in Los Angeles with this one of a kind abstract wall mural that matches the color and aesthetic of the interior space. Vivache Designs' final mural, mock-up design and spatial mock-up at C&M Cafe. The image above shows you our process from the final mural, mock-up design and spatial mock-up. This gives you a brief glimpse inside of Vivache Designs creative process. 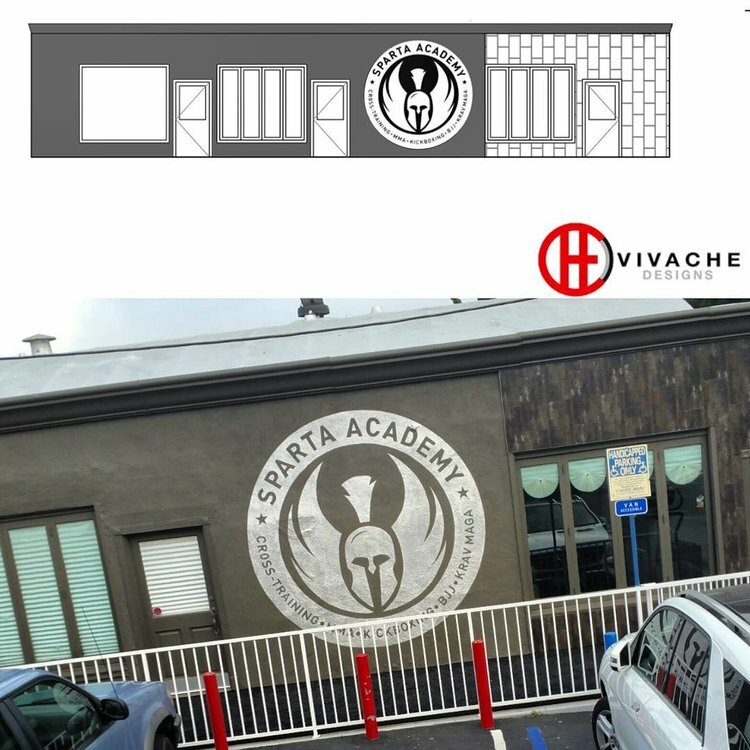 Vivache Designs is Los Angeles' premier Graphic, Design and Mural company. We continue to push ourselves by creating and practicing new techniques and processes that make us the top muralist and graphic design studio in the Greater Los Angeles Area. Below is Vivache Designs co-founder, Creative Director and lead artist Michael Che Romero's final abstract digital art piece that was then painted onto the wall. Please feel free to contact us if you have any questions or interest in our work or your next project. Below are some pictures of our work. Who Is The Best Mural Painter in Los Angeles? Why a mural painting for my business? It really depends on your business model and clientele. If you have a community based business and wall space then the answer is simple; absolutely! Restaurants, Gyms, Retail Stores, Coffee Shops, Grocery Stores & All Businesses with empty Walls. You are probably asking yourself, why a mural and what is the return on investment? And those are great questions to ask yourself. Your brand is elevated and immortalized in a hand-painted visual image that people will naturally gravitate to. Social-media friendly; it will help your brand get noticed on all online platforms (Instagram, Facebook and Twitter). You can use it for your video/photo-shoots for your Commercials, Marketing and PR Campaigns. All images above are examples of how our existing clients use our murals in their social media marketing and branding campaigns. Our work speaks for itself. With our combined customer service and our reputation as being the best mural and design company in Los Angeles, (Just Google Vivache Designs) you will see why you to will have 110% confidence in our ability to deliver you the best service and product that the industry. We are a 5 star rated company and their is a reason for that, so look no further and stop second guessing yourself because you deserve best. Let Vivache Designs create a mural & design that will resonate within and will naturally gravitate people to. Precision and accuracy are essential when painting a wall mural on a corrugated surface, so taking your time and using the right tools will make your project a success. 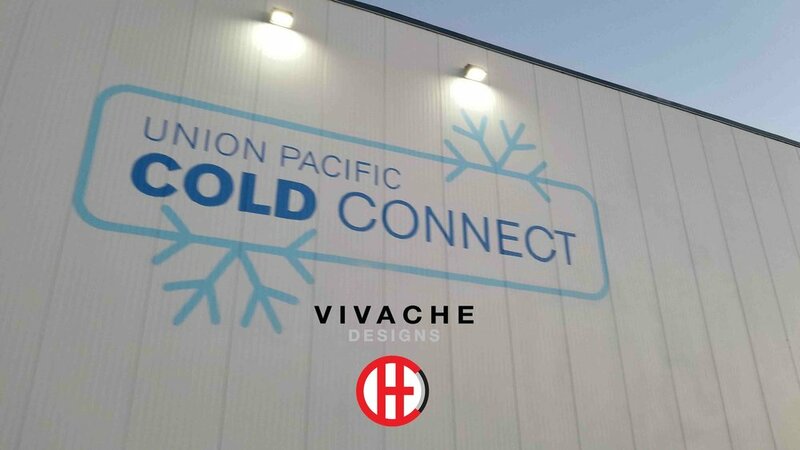 With over two decades of professional experience in graphic design and painting murals there is no project to big or to small for Vivache Designs. Give us a call and let us help you with your next project. We are based in Los Angeles and offer our services through out the United States and Internationally. We also offer all of our new clients a free 15 minute consultation.